Collaboration with Music For Peace (2001-Present): Nio has been doing dj-sets and concerts with Zero Plastica to collect food, medicines and clothes for victims of the war in Palestine, Afghanistan, Saharawi, Iraq, Sudan, Sri Lanka, Alegeria and victims of tsunami in the Indian Ocean (2004) and of the earthquake in Abruzzo, Italy (2009). Emergency (Life support for war victims): A percentage of all proceeds from Zero Plastica's first, self-titled, record (2005) goes to this organization. The group has also participated in fundraising events. In 2012, Libera, the most important association against mafia in Italy, asked Zero Plastica to write a special song dedicated to the struggle against every type of mafia. The result is "La pedata di Dio" (God's kick). The video shows the names of the local and international victims of the mafia. During 2010 Football World Cup in South Africa, Zero Plastica joined "Officially Offside" a compilation that was put together to show solidarity with the Khulumani Support Group legal action against several multi-national corporations who supplied the apartheid regime with the military equipment it used to suppress the majority of South Africa’s people. In 2009 Nio made a compilation called "Narcisisti & Ossessivi - Musica Nera della Liguria" (Obessive & Narcysistic - Black Music from Liguria) in which he collected 20 tracks of rap, reggae, R&B, dubstep, soul and folk artists, using the music to explain the complexity of the local state of mind and mental issues. All the money gained was given to Don Andrea Gallo's Community of San Benedetto al Porto, home for homeless and last people in Genova. In 2007, Zero Plastica joined the project "Un Cafesito Mami" by El V and Il Generale, by two important artists and activists from Italy. The projects work to raise funds for the campaign Cafè Rebelde Zapatista and for other activities of the association Ya Basta! which works to support the local population of Chiapas, Mexico. In 2013 Zero Plastica joined “S.O.S. FOR GAZA”, an international project to build a new kindergarten in Gaza City dedicated to Vittorio Arrigoni, an Italian activist killed in 2011 in Palestine. Zero Plastica wrote the song "Ge8 (2001-2011)" for the documentary "Genova, era il 2001." Created by two Italian film-makers Delia Pecetti and Francesca Cangiotti, the film is about the tragic story of the G8 summit that happened in Genova in 2001. 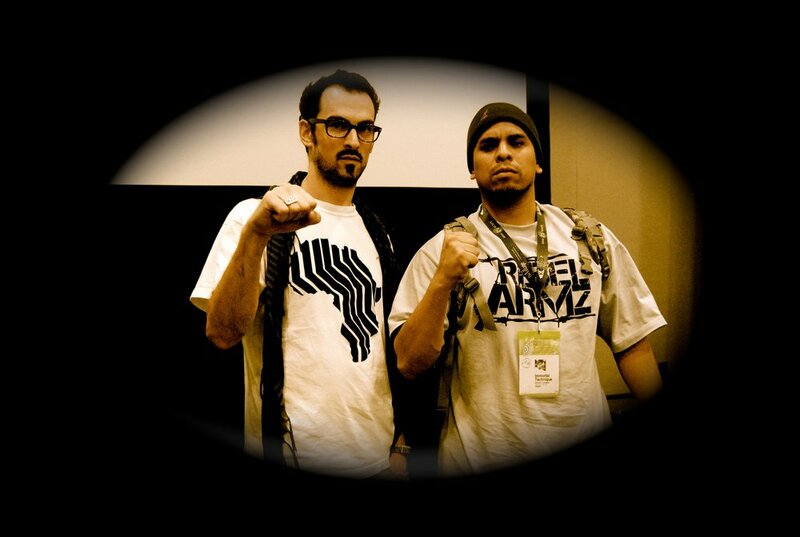 Dj Nio and Nomadic Wax teamed with Housing is A Human Right and the production of political hip hop heavyweights the Cornel West theory to release "Home", a musical conversation on the global struggle for housing (2013). This audio documentary aims to highlight a series of issues in the struggle for homes: inadequate access to employment and healthcare, war, displacement, gentrification, immigration, eviction, lack of services, homelessness and the foreclosure crisis, to name a few. Zero Plastica joined "33RPM - Voices of the Revolution", a collaborative project between four independent grassroots music organizations: Un-Convention (UK), Nomadic Wax (USA), Fora Do Exio (Brasil) and Tiuna El Fuerte (Venezuela). The four organizations understand music as a cultural, rather than purely economic, activity and seek to create cultural exchanges and dialogues through music for musicians and audiences. Also part of the project is the In Place of War research centre at Manchester University. After the terrible earthquake that destroyed the city of L'Aquila (Italy) and the surrounding area in 2009, Zero Plastica joined the compilation "Una canzone per l'Abruzzo" to raise funds for the people that have been striken by the catastrophy. While passing in the U.S. in 2011, Nio joined "Voices", a monthly event in Washington DC designed to raise awareness and funds for arts activists organizations around the world. Nio has been volunteering as guest Dj and Graphic Designer.